Herbed bread, pizza, italian dressing, roast lamb, roast chicken, and herbed oils and vinegars all call for fresh, pungent, rosemary sprigs. 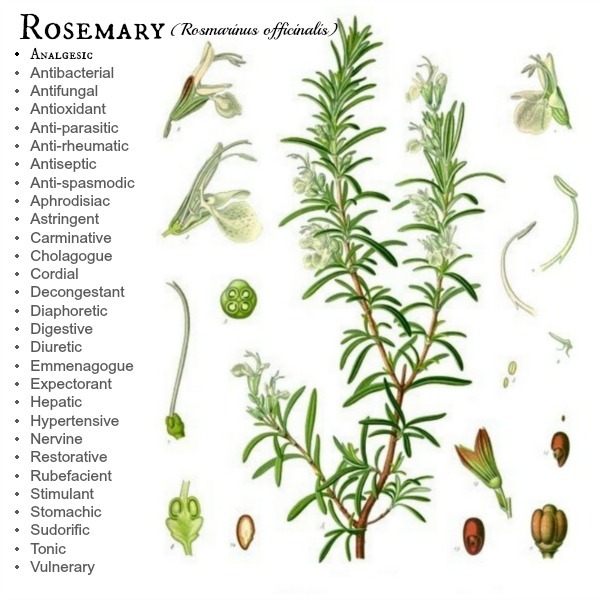 Further, rosemary or Rosmarinus officinalis is a medicinal herb used since ancient times as a digestive, wound healer, and antimicrobial agent, to name just a few of its many virtues. Any herb with “officinalis” in it’s Latin name signifies that it is an official medicinal herb with a popular history in herbal medicine. Rosemary is a perennial in zone 8 to 10. But those of us in colder climates can still enjoy growing rosemary in our gardens. 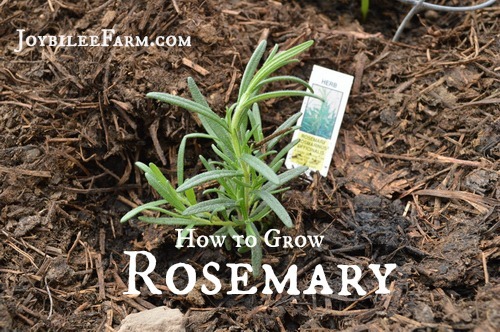 While rosemary is difficult to grow from seed, it is easy to propogate from cuttings. With a little effort you can have a year round supply to flavour your meals and stock your herbal apothecary, even if you live in zone 3, like I do. Rosemary is an evergreen shrub that is hardy to zone 8. It prefers dry, poor soil, like other mediterrean herbs. It is most often propogated through cuttings. In my zone 3, I can’t overwinter Rosemary in the garden so I begin with a nursery plant in the Spring, in my short season. As you are choosing your rosemary plants at the nursery, check for insect infestation. If you see any tiny white flies, scale insects, or aphids on the plants anywhere in the nursery, don’t bring home plants from this nursery. Even if you don’t see any on the particular plants that you are purchasing, your plants may have eggs that will hatch out at home, when the conditions are right. It’s much easier to prevent an infestation than to get rid of one, once it’s established. You’ll find several different varieties of rosemary at your local plant nursery and even more available online at Richter’s Herbs or throughAmazon. As you are choosing your rosemary plant look for varieties that you like the leaf shape of and the pungency. This is the plant that you will grow and propagate from and with a little forethought you’ll ensure your longterm success. When you bring your plant home, bring home organic potting soil, liquid kelp fertilizer, and an 8 inch terracota pot for your rosemary plant, too. Wash your pot thoroughly, and soak it in water overnight. In the morning, fill your pot with potting soil. Press down firmly. Make a hollow in the soil to receive your rosemary start. Take your rosemary plant out of the small pot. If the plant is root bound, massage the root ball gently to release some of the rootlets. Place in the pot at the same level that the rosemary plant was in it’s original pot. Firm in. Water with the kelp fertilizer according to package directions. Kelp helps with transplant shock and encourages root development in plants. After the initial watering in, water rosemary sparingly. Allow the soil surface to dry out before watering to keep the roots from getting water logged. This is the area that most people fail in as they try to grow rosemary indoors. Once all danger of frost has past, harden your rosemary plant off by taking it outside and putting it in the shade during the day and bringing it indoors at night. Do this for a week, then begin to leave it outside over night for a few days. Once your plant is hardened off, plant your rosemary plant outdoors in the terracotta pot. Sink the pot in the soil and firm soil around it to keep it from drying out and to make it easier to bring it indoors in winter. Rosemary doesn’t like to be crowded and needs at least 8 hours of sunlight every day to grow well. In the fall, lift the pot from the ground and bring it indoors before you have frost danger. Rosemary, like all herbs, will grow stronger and more compact if you prune it regularly. Plant it near your kitchen garden so that you can pop outside while your are cooking dinner and bring in a few sprigs for fresh use. As the season grows, take sprigs for infused oils and infused vinegars to use in the winter. If you have a large plant with abundant growth, dry some rosemary branches for winter tea or tinctures. Each time to cut it, it will grow two more branches from the place of the cut. In the fall, before your first frost, check the health of the rosemary plant. You can lift it from the ground, still in the terracotta pot and bring it indoors for the winter. However, if you find an insect infestation you’ll want to take a cutting instead of bringing the whole plant indoors. To make more rosemary plants from your one plant, take a 3 inch cutting from your healthy rosemary plant. Remove the lower 2/3rds green leaves from the stem. Dip the stem into rooting powder. Stick it in a mixture of equal parts of perlite and peat moss. Cover the cutting to hold in moisture. Keep the cutting out of direct sun, and allow it to root. Keep it growing through the winter and you’ll have fresh rosemary for your culinary creativity year round. Rosemary has so many amazing uses from culinary to medicinal that it’s worth your time and effort to keep a plant going year round. Rosemary doesn’t like to have her feet wet, so allow the soil surface to dry out to 1 inch below the surface before you water it when you have the plant indoors. You can keep Rosemary in a sunny window indoors or under a plant light. Here in Canada I don’t get enough daylight hours in December and January to grow Rosemary well with just natural light, so I put my plant under my growlight, while I’m growing microgreens. Once March comes I can move the rosemary plant to a south facing window and use the growlight for propagating my greenhouse plants. This is just an introduction to the health benefits of rosemary as a fresh plant, as dried leaves, and as an essential oil. I hope this triggers a desire to get to know this plant better. You can gain all these amazing qualities from rosemary by infusing rosemary leaves in oil or vinegar, making alcohol or glycerin tinctures with the dry or fresh leaves, or by using the dried or fresh leaves in tea. Use the oil in cooking or transform it into a massage oil for tired, achy muscles. Use the vinegar for salad dressing, as a meat marinade, or take it by the teaspoon like you would a tincture, during colds and flu as an antimicrobial and expectorant. Rosemary stimulates bile flow and improves digestion especially when fatty meals are eaten. Consider adding rosemary infused oil to your salad dressing as a digestive, as well as for its delicious taste. Rosemary essential oil is made from the steam distilled volatile oils of the rosemary leaves. A few drops in a room diffuser will increase memory and alertness and relieve fatique.